Heat oven to 425°F. Remove crust from pouch; unroll on work surface. Cut crust into quarters. Divide peaches evenly onto crust quarters. Brush crust edges lightly with reserved peach liquid. 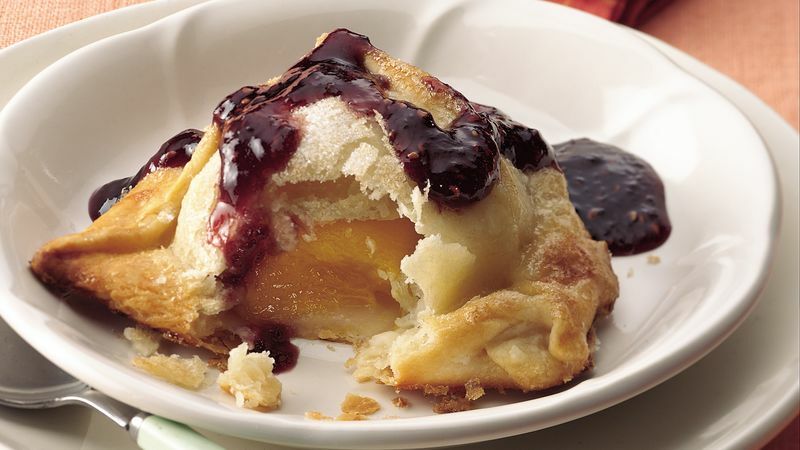 Bring sides of each crust quarter up over peaches; press edges to seal, making 3 seams. Place seam side up in ungreased 8-inch square or 12x8-inch (2-quart) glass baking dish. Brush with egg white; sprinkle with sugar. Bake 22 to 32 minutes or until golden brown. Immediately remove from baking dish; place in individual dessert dishes. In 1-quart saucepan, heat preserves and almond extract over low heat, stirring occasionally, until warm. Serve warm dumplings with sauce.